(18 December 1835, Roxbury, MA-22 October 1922, New York, NY). Education: B.A., New York University, 1853; read law, passed N.Y. bar exam, 1856. 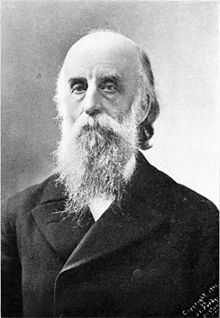 Career: lawyer, 1853-59; minister at Terre Haute, IN, 1860-65; secretary of American Freedman's Union Commission, 1865--69; minister, New York, NY, 1865--69; contributor to Harper's Magazine and Independent, 1869-71; editor, Illustrated Christian Weekly, 1871-76; editor, Christian Union, 1876--93, and its successor, Outlook, 1893-1922; minister, Plymouth Church, Brooklyn, NY, 1888-99. For better and for worse, Lyman Abbott is remembered for the aphorism, "Evolution is God's way of doing things." The phrase aptly summarizes the belief of liberal Christians at the time that Darwinism did not contradict essential Christian values. But today, a century after Abbott succeeded Henry Ward Beecher at Plymouth Church, Abbott's confidence seems naive. As an editor Abbott shaped Outlook into one of the most influential periodicals of the time. Among the writers he published was a close friend, Theodore Roosevelt. Abbott supported Roosevelt's progressive reforms and shared his advocacy of an American "empire." Of the American annexation of the Philippines he wrote, "I do not defend or apologize for what we have done in the Philippines. I glory in it." In such views Abbott reflected the values of contemporary America: humanitarian but expansionistic, inquisitive but devout, supremely confident that the world he knew operated according to "God's way of doing things." A: The Evolution of Christianity (Boston, 1892); Christianity and Social Problems (Boston, 1896); The Theology of an Evolutionist (Boston, 1897); The Life and Literature of the Ancient Hebrews (1901); The Great Companion (New York. 1904); Reminiscences (Boston, 1915; 1923); What Christianity Means to Me: A Spiritual Autobiography (New York, 1921). B: DAB I, 24-25; DARB, 4-5; NCAB 1,473; NYT 23 October 1922, 1; SH I, 7; William W. Sweet, Makers of Christianity: From John Cotton to Lyman Abbott (New York, 1937); Ira V. Brown, Lyman Abbott: Christian Evolutionist (Cambridge, Mass., 1953; Westport, Conn., 1970); Edward Smith Parsons, "Lyman Abbott," in Religion in Life, 47 (1978), 313-319.